Shigehisa Fujita joined Honda R&D Co. in 1985, working in the CIS Department (Computer Integrated Systems) at the Motorcycle R&D Center. He became Manager of that department’s Administration Division in 2005 and was promoted to Senior Manager the following year. From 2010 to 2014 he served as General Manager in the Kumamoto Branch, Motorcycle R&D Center, before being appointed to the Honda R&D Co., Ltd., as Operating Officer/General Manager of the Administration Division, Motorcycle R&D Center. 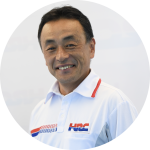 In 2017 he joined Honda Racing Corporation as Director/General Manager, Administration Division.